This month’s Touchstone column is again rooted in a children’s playground. Many of my readers must be wondering whether I have nothing better to do, or whether I spend all my time in a playground. Well, the thing is there is a small children’s park right outside my house. I have to walk by the park every day on my way to work. Since I live on campus I come home for lunch and so I get to ‘see’ this park at least four times a day; on my way in to work, back for lunch, back to work, and home in the evening. More often than not some child or the other is playing there even during the daytime, probably having bunked a boring school day. Whenever I see a child all alone, absorbed in himself/herself and doing something or the other with a piece of playground equipment, I stand and watch, fascinated. On one of these occasions I saw a child doing something very interesting. He had climbed on to the seesaw (the middle of it) and was attempting to walk on it, or rather balance on it. What he was attempting was precarious, but amazing. Standing on top of the seesaw, in the middle, he would first make sure that his feet were wide apart, for he soon discovered that if he did not do that, he would topple and fall. From that position, he kept trying to see whether he could ‘walk’ on the seesaw on one side. Of course, as soon as he took more than two steps, the seesaw would swing down to one side and he would have to step off. 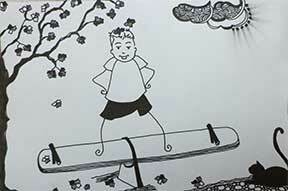 This never deterred him; he would get on to the seesaw again and begin the process, this time on the other side. Same reaction; two extra steps and down he would go. I watched this child, Akram, for about 15 minutes, fascinated. The first few attempts, he fell down because he did not know how to balance himself and more importantly, would stand with his feet together on the top of the seesaw. Soon he learnt that to stay on top and not fall, his feet had to be spread apart and placed firmly on either side of the middle groove that holds the seesaw together. This he practiced a few times, and then, once he had gotten the hang of it, he began experimenting. A step on one side, a step on the other, feet as wide as he could manage, and then, he achieved what he wanted. Arms akimbo, feet spread on the seesaw this boy was able to actually stand on top and make the seesaw go up and down just with his feet and his balance on it. Mission accomplished. When he saw me watching him, I got what every teacher likes to see on the face of any child: a wide face splitting grin of satisfaction. Akram could not have been more than 10 years old, which meant that he would not have begun studying physics as a subject. I had a chat with him, (after his balancing act) and found out that he goes to an Urdu medium school. He has done a bit of physics (not called that yet in his school time-table) as a part of science. He had not heard of the scientific term, ‘fulcrum’. I tried talking to him about it, but the concept did not make any sense to him. I tried ‘teaching’ him that what he had accomplished was just that, that he had actually understood the notion of fulcrum but I failed, for I did not have the necessary language capabilities in either Telugu or Hindi to explain all this. It also occurred to me that a few years down the line, Akram would memorize and reproduce the definition of fulcrum, probably without really understanding it. We teach our children scientific concepts in textbook style and in an ‘aseptic’ unscientific manner. All science textbooks have line drawings and definitions, but the teaching of science does not extend to the playground. If this ‘experiment’ could be ‘conducted’ by teachers in schools (many schools do have seesaws) children would never have a problem with the notions of fulcrum and balance. A simple seesaw was all it took, and like all discoveries, Akram had innately ‘discovered’ the concept for himself! This is what science teaching should be about. Science is there all around us, either as phenomena or as patterns in nature. If we could encourage our children to observe, try out, experiment and look for themselves, they too will be able to do science on their own. Not all children may have Akram’s amazing sense of balance and we may not want to test that. I am not trying to advocate the evaluation of the notion of fulcrum through a seesaw balancing act but I am hoping that its possibilities can be explored as part of having fun with science.